If you disagree, may we suggest you take a look at the new Alice for the iPad app from Atomic Antelope. It embodies everything that has given print its 550 year reign over the mind's of mankind, but moves the medium forward in a way that is both respectful of traditional print media and at the same time totally aware of what the iPad has to offer. We think this could be huge and it seems we are not the only ones. We contacted Ben Roberts and Chris Stevens of Atomic Antelope to enquire of their plans for follow up books, Ben responded, "We’ve been so totally overwhelmed by the response to Alice... We currently have 4 major publishers contacting us to talk about projects so our hope is that the next Atomic Antelope project might be on some really huge current book. It seems people have realised the iPad might have uses after all!". This is superb news, we wish Ben and Chris every success with their next project. Children's books have a special place in the history of print. When we have long forgotten the magazines, newspapers and school textbooks of yesterday, we will always remember our favourite children's storybook. 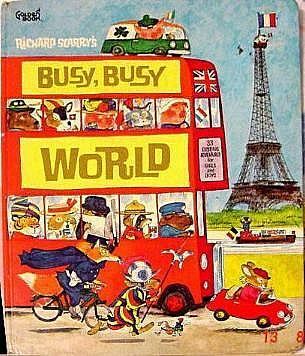 For me, and perhaps for many of you, it was Richard Scarry's classic, 'Busy Busy World'. When TV shows and movies failed us with their fast edits and complex themes, storybooks provided the perfect pace and relaxed re-reading experience that our young minds required. That's why we love what Atomic Antelope has done with this classic children's tale. It hasn't tried to shoehorn a 1990's multimedia experience into it's pages, there's no mini games or cross chapter movies, just gorgeous illustration work and a restrained measure of interaction that is perfectly tailored to the inquisitive nature of young children. Of all the iPad magazines and books that we've seen so far, Alice for iPad is the one that makes the most sense to us. The use of physics modelling brings a layer of reality that will surely delight younger children. The cynical reader might suggest that Alice for the iPad is nothing more than a collection of animated scenes, but for us, the presentation style, the fun but subtle level of interaction presented on the iPad's gorgeous display pushes this way beyond that dry description. The iPad is only 3 weeks old, we are already astonished by many of the new iPad apps. A year from now and we'll look back at these formative weeks and see the pattern of what was to come, nothing short of a revolution. A few days ago we highlighted the skill of a handful of iPad artists. These talented individuals have an opportunity put their skills to work in ways they may not have considered. The genre of children's literature is awash with classic stories that have never come under copyright law. What prevents artists teaming up with coders to create compelling iPad experiences like Alice for iPad? The Alice app has certainly made people sit up and take notice, and it is for sure a launch pad for other creative approaches to story telling and engaging the consumer. It is really exciting to think what will be developed in the near future. Nice post! What a fantastic app! Exciting times. Amazing, isn't it! Thanks for stopping by Rupert. Is this works on i phone?